Rainbow and Wild Flowers on the road to Ballyferriter from Dingle. Hi there! It’s been some time since you last saw me here. I just took a break from blogging and some other online activities due to constraints related to moving house. Very limited electricity and internet service made it just too challenging to continue blogging. The house move still isn’t complete, the internet is still basic and slow, but I have electricity. I hope it won’t take more than a few more months to complete the process. Of course I have continued to take photos, though my painting is on the back burner. After several months spent in the lovely location of Ballyheigue, I have moved back to the Dingle Peninsula. It’s surely one of the most stunning places in the world. In fact, National Geographic Traveler has described the Dingle Peninsula as “the most beautiful place on earth”. I agree. Weather is never predictable here, and very often it’s the weather that makes the image. Looking at many of my photos and paintings you will see that light, shadows, clouds, rough seas and rainbows are essential features in the compositions. This summer has seen some of the coldest and the wettest weather in about 30 years here. However, the old saying that every cloud has a silver lining can perhaps be applied, as frequent showery and sunny spells have also brought the most lovely rainbows. 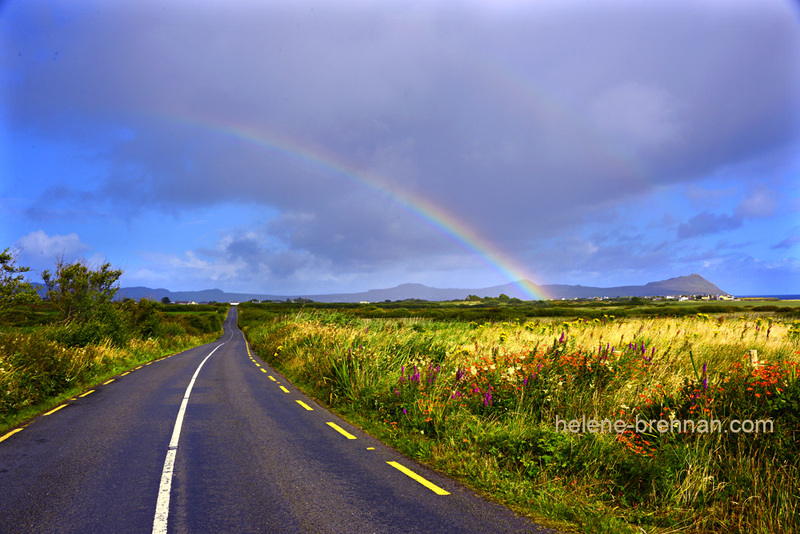 The above photo shows one of those fleeting rainbows that suddenly appear, the road to Ballyferriter from Dingle, with the iconic Three Sisters in the distance and stunning wild flowers in the field and by the roadside.